The Method MR305 Matte Black/Machined Face NV is a one-piece wheel that features a simulated beadlock ring by way of a strategically placed under-cut on the outer lip of the wheel. The MR308 Roost Bronze is a groundbreaking wheel that utilizes our knowledge gained in off-road truck and rally racing. The Grid is the result of combining the design of the Mesh split six-spoke design and the simulated beadlock ring found on some of our most classic wheels. The Fuel D538 is a one-piece wheel in black finish and milled accents. 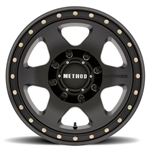 It features an eight spoke wheel design and added rivet accents on the lip and cap. 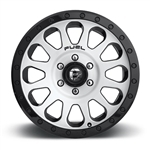 Fuel D569 Wheels will give your truck/SUV a tough looking exterior and are made for the ultimate off-road experience. Featuring 7 spokes all in a matte anthracite finish with black ring. The Method MR310 Con 6 is a clean and simple 6-spoke wheel. The FUEL Trophy is a clean 8-spoke wheel that is available in Matte Black finish with an Anthracite ring. The FUEL Trophy is a clean 8-spoke wheel that is available in Anthracite finish with a Matte Black ring. Toyo Open Country On/Off Road all-terrain tire Pavement is optional with these versatile all-terrain tires. They offer over 40% more treadlife than the leading competitors*, a blatantly aggressive tread design, and a quiet ride.